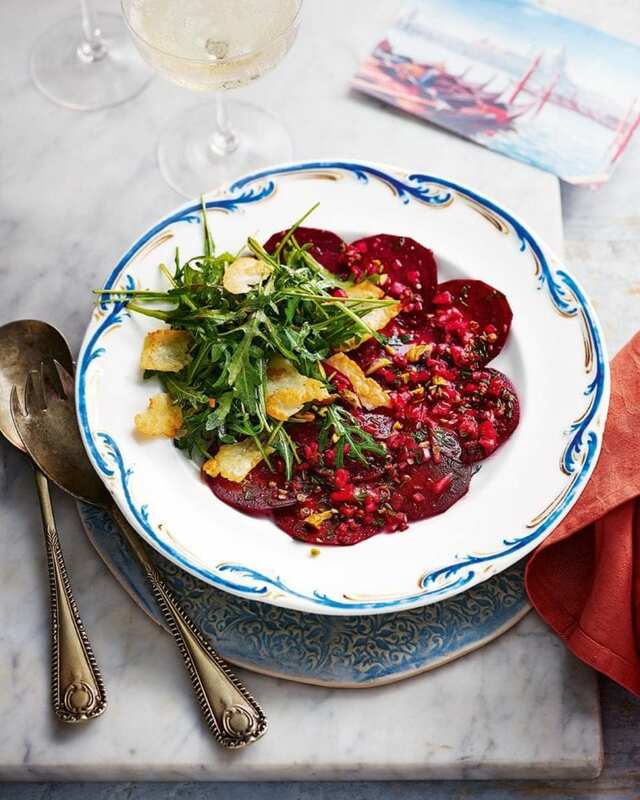 Sharp marinated beetroot, salty halloumi shards and sweet pomegranate molasses combine in this elegant vegetarian carpaccio dish. Trim the beetroot, then peel and slice finely (it’s easiest with a mandoline or food processor). Put the slices in a glass or ceramic dish. Add the lemon juice, 3 tbsp oil, dill, shallots, spices, sugar and salt, then toss. Cover and marinate at room temperature for at least 30 minutes. Shave the halloumi using a mandoline or Y-shape peeler. Line a large plate with kitchen paper. Heat 0.5cm olive oil in a large pan and add a halloumi slice. When it starts to sizzle, add more slices to fill the pan and cook for 2-3 minutes until light golden, turning once using tongs or a fork (be careful, the oil will spit). Once browned, dry the crisps on the kitchen paper and repeat until the cheese is used up. To assemble, toss the rocket with the pomegranate molasses and a drizzle of olive oil. Divide the beetroot among 4 plates, then dress with some of the marinade. Top with the rocket, some halloumi crisps and pistachios, then serve. Marinate the beetroot up to 24 hours ahead and keep covered in the fridge.